I’ve been telling people that kolaches are the next big thing. 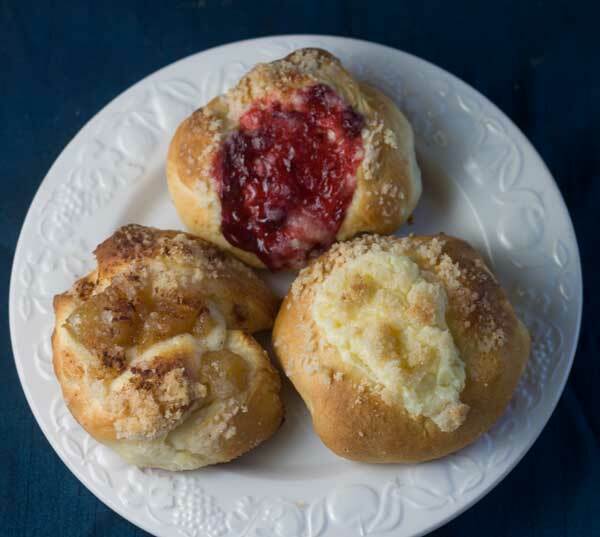 I have no idea if this is true, but as I tasted the apple, raspberry and cream cheese filled kolaches from this morning, I decided there’s no reason why 2014 shouldn’t be the year of the kolache at our house! This batch was adapted from a recipe I tried back in 2007 which made 48 rolls. That was about 45 more than I needed, so I scaled it down and made 16, which seemed more reasonable. 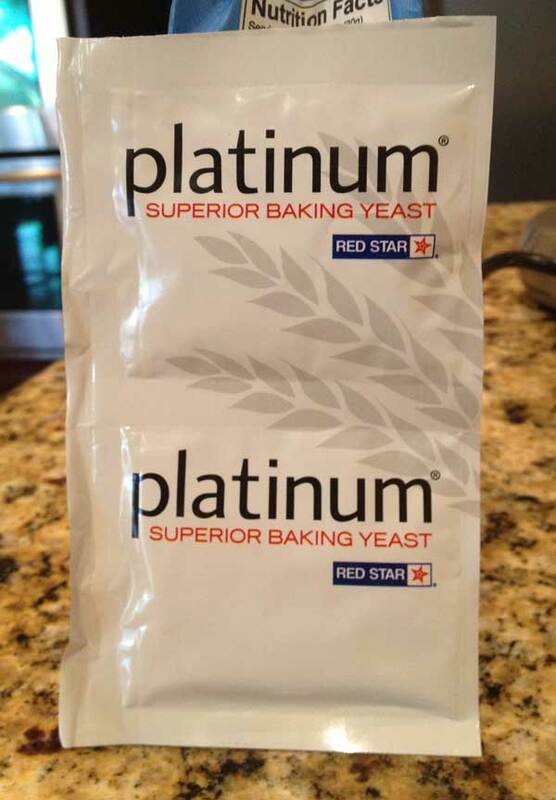 I also incorporated a product I discovered over the holidays called Red Star Platinum Yeast, which is a high rising yeast that contains dough conditioners. So far I’ve used it in cinnamon swirl bread, cream cheese braids, and dinner rolls, and in every instance, the breads were softer and rose higher. Bread flour is also a must for me these days, and because I’m a yeast killer I used a thermometer to ensure the milk was exactly 130F. The kolaches were excellent, though I’d be lying if I said I wasn’t going to try more recipes . If you do a search for kolache recipes, you’ll see that some call for more egg, more butter, sour cream, milk, and I’m still hoping to find one with mashed potatoes. If you try the recipe, let me know what you think! Also, my favorite filling is cream cheese, so I included the recipe. For other fruit flavors, you can make fillings or use good quality canned fruit pie fillings. Many people like filling these with savory things such as sausage, but I like to keep them sweet. Czech style kolaches with cream cheese filling. Put the milk in a microwave-safe measuring cup and heat just until it starts to boil. Let it cool down to 130 degrees F.
While milk is cooling, put the 5 ½ tablespoons of butter and sugar in a mixing bowl and beat with a spoon. Stir in the egg yolk, 2 cups (250 grams) of the flour, salt and yeast. Mixture will be crumbly and dry. Gradually add the milk and stir until thoroughly mixed. From this point, add remaining cup of flour by quarter cups until you have a soft dough that is neither too sticky nor too dry – though it should be more sticky than dry because kneading will remove some stickiness. Put the bowl on the mixer stand and knead with the dough hook until it is smooth and elastic. Rub an empty mixing bowl with butter, put the dough in it, cover and let rise until doubled in bulk, about 1 hour. Punch dough down and turn out onto lightly floured surface. Pinch off 16 equal size portions and shape into little balls or blobs. Place 8 balls on each of two parchment lined baking sheets. Cover loosely with a greased sheet of plastic wrap and let rise for an hour. While rising, mix together ingredients for the topping and filling. Make an indentation in each risen ball and fill with a tablespoon of cream cheese filling. Brush gently with butter and sprinkle the topping over the bun and filling. Preheat the oven to 400 degrees F and let the buns sit while the oven preheats. Bake for about 15 to 20 minutes at 400F. These are good warm or at room temperature. I like the fruit filled ones warm, but prefer to let the cheese version cool down. ** In the end I used about 360 grams of flour, but it’s best to go by texture and feel of the dough, so start with 2 cups and mix in the remaining flour in gradually. Dough will be slightly sticky before kneading, but should become smooth and elastic after kneading. I mixed my dough with a spoon, but I did use the dough hook of a stand mixer for kneading. If you like the process of kneading by hand, you can make this whole recipe with just a bowl and a spoon. Hi Mary, I would love that! Thanks so much. My husband is Czech. His aunt always made kolache for us with prune or apricot filling. Now that she is gone I continue the tradition. I tried your cream cheese filling and added dark chocolate chunks. What a hit with all the grandchildren! BTW- I have the potato dough recipe passed down from Aunt Lil. I’ll share it tomorrow when I return home from my travels. This cream cheese kolaches recipe is so amazing!! I just made these and they are more delicious than the ones I bought yesterday at a Czech bakery!! The bread is so light!! I am a native Arkansas but discovered kolache when as a student at Texas A&M I did my teaching internship at Caldwell High School. They have a festival celebrating these bits of ambrosia. Last Saturday, I followed the dough recipe and used our bread machine. Then used Hebrew National hotdogs wrapped with pepperjack cheese. After Monday’s breakfast they were gone. I’m making more this evening for my wife to take to school in honor of her colleague a retiring professor. Please share the mashed potato recipe, maybe this dough would make a good knish wrapper. Yes, thank you! I suspected that the “s” at the end of kolache did not belong there. Oh. My. Gosh. Kolaches!! I am a Tex-pat, and one of the things I miss most are the kolaches. The kolaches in Texas are special. I haven’t been able to find anything like them anywhere else. I especially miss the savory ones, particularly the pan sausage, jalapeño, and cheese from Hruska’s in Ellinger! Anna, if you ever get a hankering to reproduce that recipe, I will be forever indebted to you! Karen, I’ve never used vital wheat gluten in baking, but one of these days I will pick some up. At this point, bread flour seems to be doing the trick! I’ve been doing through bags and bags of it lately. Kathy, thanks for trying the recipe and taking the time to post some feedback! it is MUCH appreciated. I actually made a different recipe using a potato dough today and another version similar to this one that calls for shortening in place of butter and evaporated milk in place of regular milk. So far, this one is still the winner. Tomorrow I’m going to try a recipe that includes sour cream. Anyhow, thanks for taking the time to let me know you tried the recipe and that it worked for you. I meant Czech heritage, not Polish. Check out this website. I may be a native Minnesotan but not from Polish background and had never heard of this festival. Now I want to go! ‘Mrs. Wiser called them kolacky but I never saw her make savory ones; only fruits like apricot, peach, strawberry, apple, raspberry. She only made them at Easter. As far as I can figure out Kolaches is the plural and Kolache is the singular. The Montgomery festival has all kinds of contests for baking the kolacky. I never thought of making sweet kolaches. This sounds wonderful! I LOVE cream cheese filled bakery goods. I use vital wheat gluten when I want specially light bread dough or if I am using a heavy proportion of non-white flour. I made a batch of 7 grain bread the other day for my daughter and son-in-law and did NOT put the vital wheat gluten in… DANG, the bread was fine except that it really did turn out heavier than I wanted. I know better, but for some dumb reason followed the recipe to the letter. LOL. I don’t know what the singular or plural of Kolache is. It’s an interesting question! I googled it and found different answers. I know an older Polish man. I’ll try to remember to ask him sometime. Sue, is kolache the plural form? I know panini is actually the plural form of “panino”, but I feel silly running around saying “panino” even though it is technically (as far as I know) correct. So I’m trying to figure out the proper way of saying kolache or kolaches. Also, I found a potato version on Food.com and am giving it a test run this afternoon. the dough needs 8 hours of refrigeration, so it’s currently chilling. Your Kolache look wonderful. I looked through a number of church cookbooks, fundraiser cookbooks and old cookbooks hoping to find a mashed potato version of Kolache for you but none of them used potatoes. Good luck with your quest. It sounds like a fun, tasty adventure. Happy new year! I have never had these before but would like to try them. One of these days, I will do some yeast baking. The cream cheese filling looks great. I tried to make sourdough Kolaches recently but they didn’t turn out so well. We don’t have them here, so I have no way of knowing how they should come out, but yours look very tasty!